Each school year, Friends of the River San Bernard offers graduating Seniors, living in or attending a high school within the San Bernard watershed, a scholarship opportunity. Applicants must demonstrate a direct connection between their career path and the betterment of the environment. This year six $1,000 scholarships were awarded. Brandi Stroud, recipient of a $1,000 FOR scholarship, ranks fifth in her class of 193 at Columbia High School in West Columbia. She will major in Computer Science at UT Austin. Brandi’s high school years have been full of activities and awards including soccer, cross country, Thespians, National Honor Society, Columbian Newspaper editor, UIL Number Sense, feature writing, computer science and math teams, academic all-district, numerous senior class academic honors, and participated in many fundraising and community service activities. She’s a third-degree black belt in taekwondo and winner of regional, state and national competitions in high-speed pistol shooting. 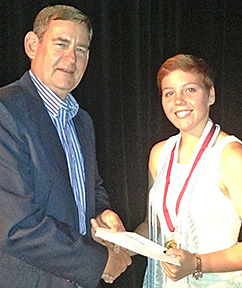 Director Tom Ronayne presented a FOR San Bernard $1,000 scholarship to senior Brandi Stroud at the awards ceremonies on Thursday, May 12th. 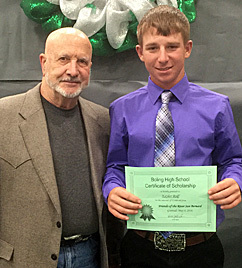 Director Tom Ronayne presented a FOR San Bernard $1,000 scholarship to senior Colton Leopoldo at the awards ceremonies on Tuesday, May 17th. His awards and extracurricular activities include the National Honor Society, Band, Football, FFA, Colorado County Grand Champion Steer in the 11th and 12th grades, top 10% Honor Roll, Texas Boys State, plus, offices in a number of student organizations. Colton also volunteered for numerous activities that include St. Mary's Youth Group, Knights of Columbus cook-off and fish fries, Diocese of Victoria Youth Leadership Training, Camp David staff, county fair set up and clean up, and My Mission 9 that served the homeless in San Antonio. 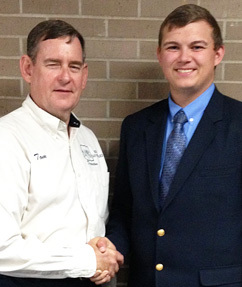 Gig' em, Jacob Warschak received his FOR San Bernard $1,000 scholarship at the award ceremony on Tuesday, May 17th. Jacob Warschak, recipient of a $1,000 FOR scholarship, ranks seventh in his class of 98 at Columbus High School in Columbus, Texas. He has been accepted to Texas A&M Dwight Look College of Engineering and plans obtaining a Masters Degree in civil engineering. He then wants a career with an engineering firm involved with agricultural implement design. His awards and activities include the National Honor Society, FFA, Technology Club, Science Club, UIL Number Sense Competition (fourth in district), Colorado County Youth Ministry, numerous FFA awards, top 10% Honor Grad, and perfect attendance during all four years of high school. Jacob’s volunteer activities include St. Anthony's Church picnic, vacation Bible school and nursing home visitation, Knights of Columbus work days (cut firewood, served meals, etc. ), Rotary Club highway clean up and pancake supper, county fair, Columbus Trash Off Day, and Salvation Army bell ringer. Kaylor Rolf is a $1,000 FOR Scholarship recipient from Boling High School. Graduating 10th in his class of 77, Kaylor plans to attend Sam Houston University to earn a Master's Degree in Environmental Engineering. He has already been accepted for enrollment. Kaylor was very active during his high school years with extracurricular activities such as Habitat for Humanity, Fellowship of Christian Athletes, National Honor Society,and FFA. He also participated in sports earning a Baseball MVP and Basketball Honorable Mention his senior year as well as Captain of the Varsity Golf Team, his most favorite sport. His Ag awards are too numerous to list here but includes Outstanding FFA Member, and High Point FFA Student Belt Buckle Award. Of special interest was the statement made by one of Kaylor's instructor's that stated; "Kaylor is one of those rare students that comes along in the life of a teacher that makes a permanent impact felt for the the rest of their teaching career". FOR Vice President Fred Kanter presented a FOR San Bernard $1,000 scholarship to senior Kaylor Rolf at the school's awards ceremony on Mon, May 9. 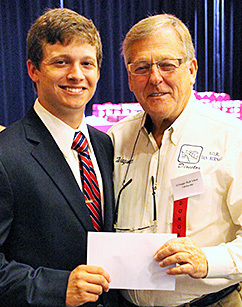 FOR Past President 2012-14 Wayne Head presented a FOR San Bernard $1,000 scholarship to senior Jacob Supak at the El Campo High School Scholarship Presentation on May 19, 2016. 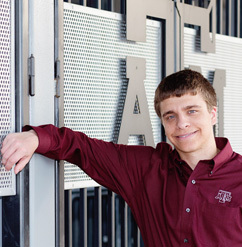 Jacob Supak recently received a $1,000 FOR Scholarship and plans to attend Texas A&M with a course study in Biological and Agricultural Engineering. Jacob graduated from El Campo High School ranking number 5 in a class of 202. Jacob wants to complete a Master's Degree and go to work for a major corporation. Jacob was a very busy young man during his high school years participating in Student Council, Anchor Club, FFA, National Honor Society, Interact Club, football, baseball and track receiving awards for Academic Excellence, Lion's Club Best All-Around Boy, First Team All-Academic in football, and Elk's Student of the Month just to name a few. While participating in all the above activities Jacob found time to volunteer in over 25 programs including community, church and school and as varied as Relay for Life, Reading with Second Graders, Habitat for Humanity and Taiton Community Fall Festival. Jacob wrote "I push myself to be the best....I like to investigate and find new ways to do things, making processes better or more efficient...thinking outside of the box".